Antique outdoor lighting can help you restore the personality and beauty of your home by bringing that vintage look to your home's outdoors. You don't have to sacrifice a well thought-out lighting project because of an old home. Use it to your benefit and make it a part of the attraction of your outdoor environment. Of course you'll want to keep your lighting scheme consistant with the beauty that your home already possesses, so adding antique lighting fixtures will help to finalize your project. Antique fixtures come in many different finishes. Each one has a distinct look to match your home's decore. For example, you may like the old-fangled look that only copper outdoor lighting fixtures can give you. As time goes on their character and beauty begin to show more and more. Or maybe you just love how bronze outdoor lighting fixtures blend into the beautiful bronze sculputures you have showcased throughout your home's patio or garden. Your antique lighting finishes should blend into your exteriors and add to its beauty and charm. Whenever choosing fixtures keep it consistant. Its best to keep the finish the same but also to purchase your lighting fixtures from the same manufacturer. Each manufacturer of outdoor lighting fixtures has various models to choose from and each model is usually part of a family of fixtures whose style matches the others. More often than not it's best to stay with the same manufacturer and family of fixtures. This way you can guarantee that the color of each fixture matches the other fixtures you've purchased. Each company manufactures fixtures a bit differently. Any small difference in manufacturing processes can cause a noticable difference in color when compared to fixtures from different manufacturers. What makes antique lighting fun and exciting is the different styles that are available. Now I'm not going to attempt to convince you to choose one style over another, but remember that you always want to keep it consistant. 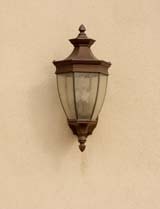 Retaining that old time charm is what antique lighting was meant for so remember that it's not just another fixture, antique outdoor lighting is part of your outdoor lighting design.